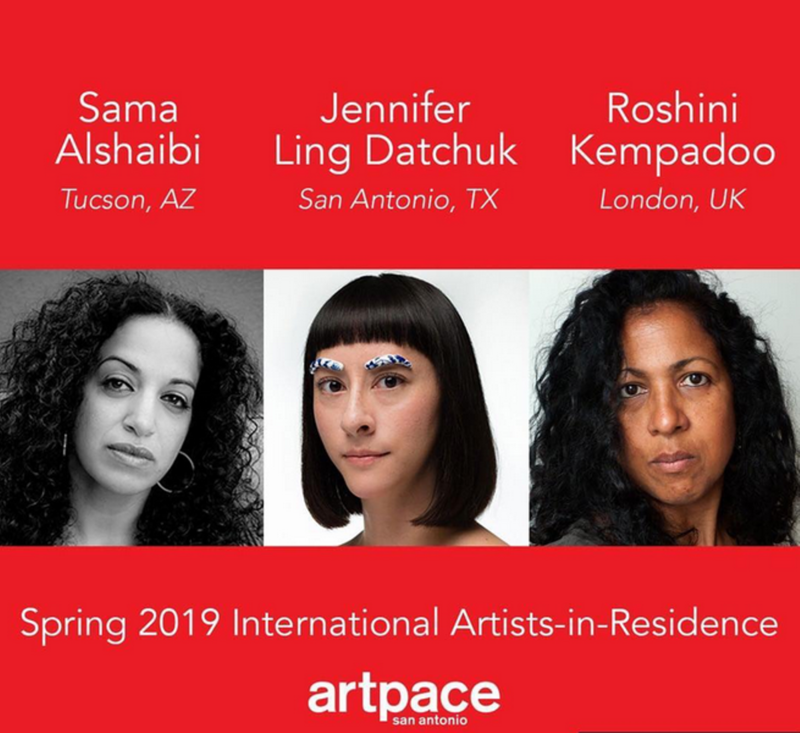 Quite often with the exhibitions born out of Artpace’s world-renowned International Artist-in-Residence program, connections and common threads can be elusive at best. The opposite might be said about the trio of forthcoming exhibitions created by current residents Jennifer Ling Datchuk (San Antonio), Sama Alshaibi (Tucson) and Roshini Kempadoo (London), three accomplished women artists selected by Deborah Willis, a New York-based curator and professor who chairs the Department of Photography & Imaging at NYU’s Tisch School of the Arts. Beyond echoing Willis’ area of expertise by employing photography as a tool for expression, all three artists took the opportunity of the residency to realize fascinating, multifaceted projects that explore race, identity, cultural stereotypes and the representation of women. Born in Ohio and raised in New York, Datchuk investigates conflicts associated with her Chinese, Russian and Irish ancestry through ceramics, including porcelain objects adorned with blue-and-white patterns reminiscent of Chinoiserie. While her Artpace exhibition involves fashion photographs made in collaboration with Lane Pittard and handcrafted, collected and curiously altered porcelain objects, the focal point is something she says she’s “always dreamed about doing” — a massive red curtain made from synthetic hair that’s been tricked out with porcelain beads adorned with affirmations such as “You Have as Many Hours in a Day as Beyoncé” and “Be Brave, Don’t Be Bitter” as well as region-specific sayings like “One Potato at a Time.” Raised in the Middle East by a Palestinian refugee mother and an Iraqi father, Alshaibi creates interdisciplinary work rooted in both her family’s loss of homeland as well as the Western world’s history of misunderstanding and misrepresenting the realities of Arab women. Directly referencing staged, costumed portraits created by Orientalist photographers working in the Middle East in the late 19th and early 20th centuries, she creates sculptural props — including dysfunctional vessels, burdensome luggage and conceptual water pipes — and models for her own photographs, which jab at the source material from a feminist perspective but also address pervasive issues Arab women still face today. Simultaneously beautiful and bizarre, Alshaibi’s latest black-and-white self portraits are joined at Artpace by visual responses to ways in which Palestinian women were represented in the media in the ’60s and ’70s, archival news footage mixed with performance-based video work and a neon sculpture based on Ali Baba’s clever slave girl who killed the 40 thieves in One Thousand and One Nights. Taken together, Alshaibi’s collected works offer what she describes as “a history, a timeline, of the presence of [Middle Eastern] women in images.” A self-described “media artist” who spent her formative years in Guyana and later helped establish the U.K.-based Association of Black Photographers and the women’s photography agency Format, Kempadoo boasts an impressive background in documentary work but has never been fully satisfied with the limitations of traditional photography. Working with Photoshop since its inception, she creates montages that blur lines between fantasy and reportage — imagined narratives that play out against real-world backdrops. Like the work of Datchuk and Alshaibi, Kempadoo’s is closely tethered to her heritage and deftly challenges cultural misconceptions. During our studio visit, she explained that she “came into photography being very aware that there was an incredibly strange perception of what the Caribbean was at that time.” Upon receiving her invitation to travel here for an Artpace residency, she decided to research connections between Texas and the Caribbean, which she inevitably found through oil and gas.